Home / airport / local news / trains / Oman's rail network. As you can see, there are 4 phases. Phase 1 being Muscat - Sohar, Phase 2 being Muscat - Al Duqm (thats a long stretch! ); Phase 3 being Sohar to Al Ain, and Phase 4 being Sohar - Dibba. That suggests a lot for Sohar! And Duqm - the line down to Duqum predicatably snakes down to Nizwa, but surprisingly shoots off to Ibra in a separate arm. Now that part of the country is still mountainous, and the cost of building that rail connection strikes me as a bit of a financial non-starter. Is Ibra a large importer of something? Does it export minerals or something? Surely it'd be more economical to truck it from Nizwa? Or a station closer to Ibra along the way to Duqm. 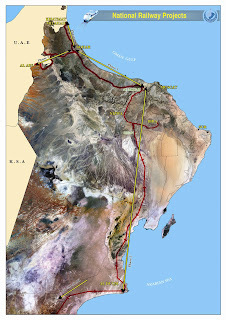 There's not much mention of the Salalah connection, but presumably that is in the works, or perhaps all things stop at Duqm for the time being? In other news, Muscat Airport Main Contract 3 (MC3) is still not awarded. Addendum 4 was issued recently and there are still tendering Contractors in the race. Latest rumours say it's a three horse race between: Bactel, CCC - TAV (a Joint Venture), and J&P. Didn't that big thing in the news paper the other month say that it would be awarded by the end of June? I guess that's not happening then! Enjoy the weekend everyone - I wonder if England will actually win their game tonight in the World Cup? kick off in less than 2 hours! Now that will be one pleasant train ride ! I gotta problem with the map. It shows Al Duqm where Ras Madrakah actually is. Al Duqm is a way north of where it is shown - check out Google Earth and see the building and construction going on at the point of the bay well north.